With the economy enjoying low inflation, very low unemployment, good growth, and sky-high consumer confidence, the Fed’s plan to hike rates at three-month intervals through 2019 is easy. It made no waves because the economy has had no adverse reactions to the rates rises thus far. 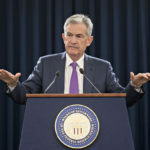 Should the economy stumble, the Fed will minimally pause the hikes. In 2020, rates may begin declining as growth will be noticeably weaker.